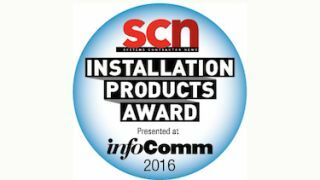 SCN announced the winners of the 2016 InfoComm Installation Product Awards in a ceremony during InfoComm 2016 on June 7 at the Las Vegas Convention Center. The awards showcase the most innovative commercial AV products of 2015. The ballot of finalists was chosen by an independent panel of judges by narrowing down the field of submissions to no more than four products per category. The winners were then selected by you, our readers, after a month of online voting.